Napoleon has escaped exile on Elba to retake the French throne in early 1815, but is surrounded by the armies of the Seventh Coalition determined to remove him again. Napoleon's only chance is a pre-emptive strike, to disrupt the Coalition's plans and perhaps cause it to fall apart. Belgium has the closest targets, the armies of his two most steadfast opponents, Britain and Prussia. The French concentration, secret and swift, catches the Coalition armies off-guard. For four days, the armies manoeuvre and clash, with the fate of Europe in the balance. This game is a reprint and update of the classic SPI game. The map covers the entire campaign area, featuring the towns, roads, rivers, woods, chateaux, and ridges that affected the fighting. The colourful units in the game include infantry, cavalry, and artillery brigades, plus key leaders. 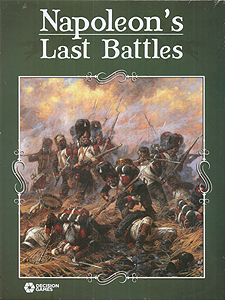 The original game's scenarios are intact, covering the entire campaign or using just a portion of the map and counter set to cover each of the four principal battles fought historically: Ligny, Quatre Bras, Wavre, and Waterloo (or La Belle Alliance). The one-day mini campaigns and Wavre variant from DG's 1995 reprint also return. Over 90 extra units have been added to make potential reinforcements available, to modify the orginal order of battle due to new research, or to give players the means to alter each army's counter mix. Optional rules present variants for several of the standard rules.